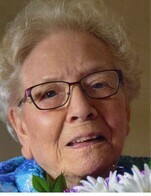 "Alma was a wonderful lady with air much love to give. She will me greatly missed"
Condolence: We were so saddened to hear of your Alma’s passing. She had such a loving and caring heart to all she knew. We will always treasure her many hugs and smiles when she would church. She was the kindest lady ever. We were away to Alberta and were sorry we missed her celebration. Condolence: Wilma & Lida and families, extending my deepest sympathy, she was a wonderful lady! Condolence: Wilma, Lida and families. We are very sorry to hear of your mom's passing. Keep happy memories in your hearts and know you are in our thoughts and prayers.